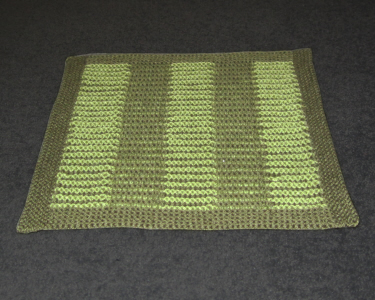 This is a very simple striped design intended as an introduction to Woolly Thoughts illusion patterns. It is so easy that once you have established the pattern you probably won’t need to use the chart again. When you look at the square from directly in front you see only narrow ridges of alternating colours. When you look from an angle you see broad stripes of the two colours. 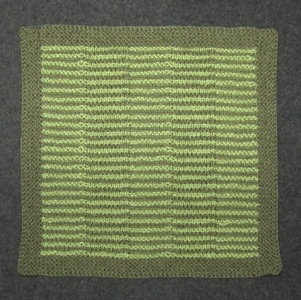 The square could be used for an afghan block or a washcloth. The pdf pattern includes instructions for a garter stitch border, which is not shown on the chart You can omit the border, if you prefer. Using Light, cast on 50 stitches. This counts as the first row of the first ridge. 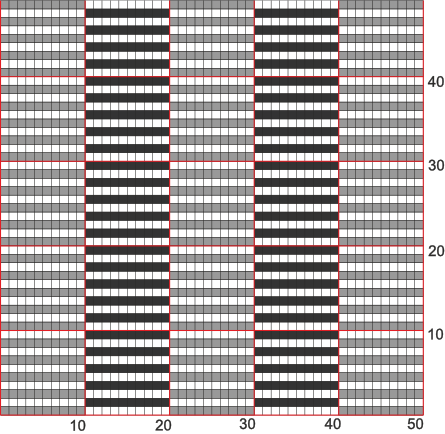 The chart shows k10, p10, k10, p10, k10. Ridge 2 (Dark) : Knit the first row. On the second row knit the coloured stitches and purl the white stitches. Ridge 3 (Light) : Knit the first row. On the second row knit the coloured stitches and purl the white stitches. Ridges 4 - 49 : Repeat ridges 3 and 4 twenty-three times, casting off on the last row.